Part 1 (overview) of this 7-part series, which is taken from a recent presentation I made at UCLA, can be found here. Part 2 (monetary policy) can be found here. Part 3 (fiscal policy) can be found here. Part 4 (economic fundamentals) can be found here. Part 5 (market fundamentals) can be found here. Real oil prices have once again exceed the early 80s highs, but that doesn't necessarily mean another recession. 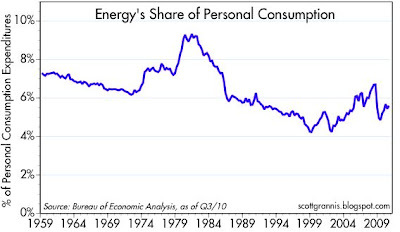 Conservation and technology have significantly reduced the amount of energy required to fuel economic growth. 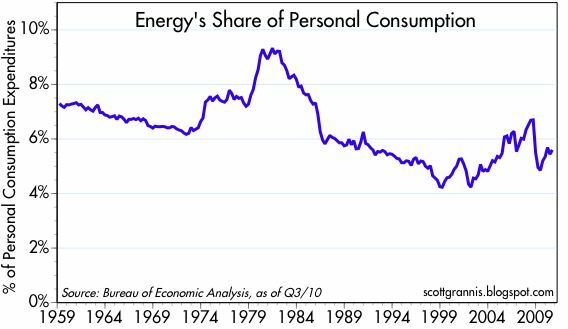 Even though energy is more expensive now than ever before (with the brief exception of mid-2008), today we spend about one-third less of our incomes on energy than we did in 1982, because we use less of it in our daily lives. The rebound in commodity prices reflects stronger global growth and accommodative monetary policy. Rising gold and commodity prices is likely a precursor to a rise in the general price level. 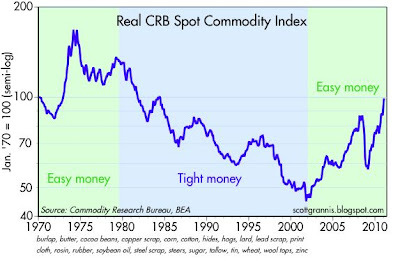 In real terms, the rebound in commodity prices has taken them back to their 1970 levels. Easy money seems like a primary cause. Easy money typically encourages people to invest in physical goods that hold their value over time, while tight money reverses that tendency, encouraging people to invest in financial and productive assets. 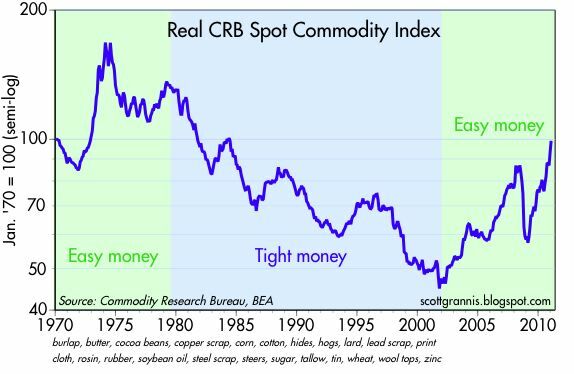 The across-the-board strength of commodity prices is an excellent indicator of healthy global growth, but also warns us that monetary policy (both in the US and abroad, since commodities are rising in all currencies) is playing an important role, and this is a portent of rising inflation. Is it your belief then that when the U.S. reverses course on its monetary policy and starts to tighten that commodity prices - I'm interested particularly in your opinion on gold since it gets a lot of media attention - will fall? 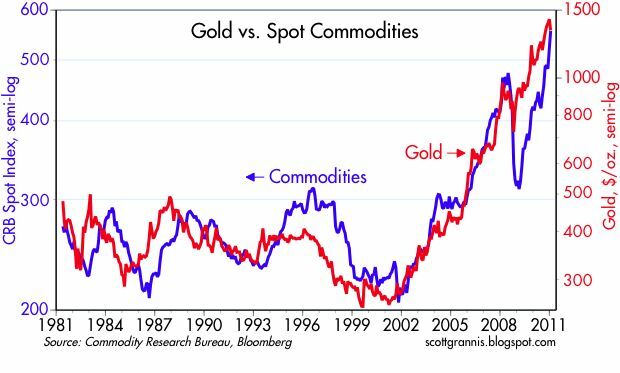 Commodity prices, and especially gold and other precious metals, are, I think, quite vulnerable to any move on the Fed's part to reverse course. 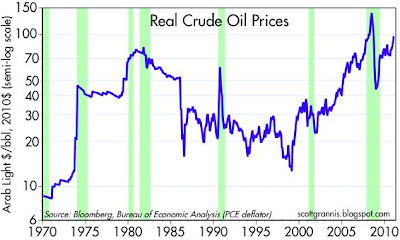 It is possible, though, that if the Fed takes only baby steps to tighten, and if they are in a reactive mode rather than a proactive mode when they tighten, that commodity prices could continue to rise. That was pretty much the case throughout the 1970s. The only thing that put a stop to it was Volcker's decision to tighten aggressively.